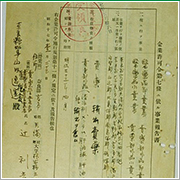 Corporate history-Stage 1: Founding stage: 1887-1945 | Ominedo Pharmaceutical Industry Co., Ltd.
Wishing good health and happiness to all. Ominedo is a long-established manufacturer founded in 1900. We maximize the power of natural products by using supercritical (Co2), alcohol, and hot water extraction techniques as well as manufacturing techniques which have been sophisticated since the founding of the company. 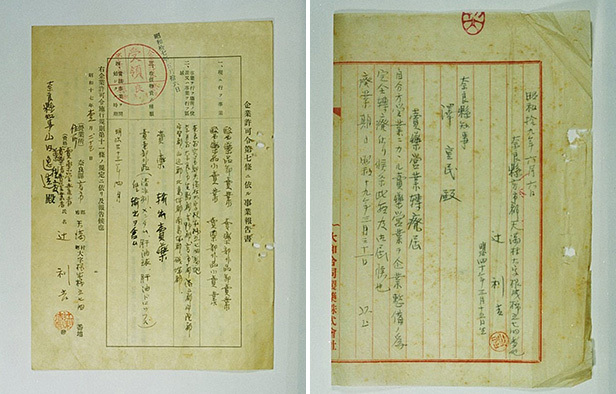 A document provided when the manufacturing and marketing license of “Gyojagan” was given by Mt. 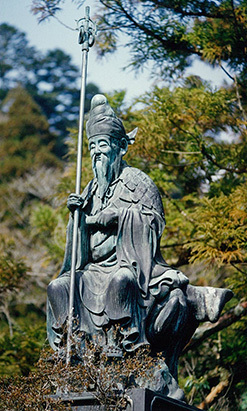 Omine Ryusenji Temple. 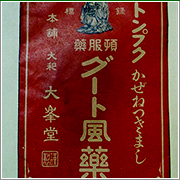 Rikichi Tsuji had already received the manufacturing and marketing license since before the founding of the company. 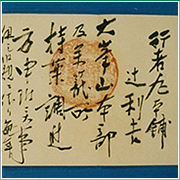 This document approves the manufacture of a medicine called “Gyojagan” and sales of it with a figure of En no Gyoja. 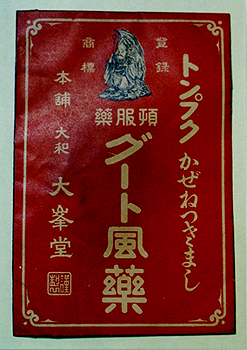 Rikichi Tsuji founded “Gyoja Hompo Ominedo” pharmaceutical company. 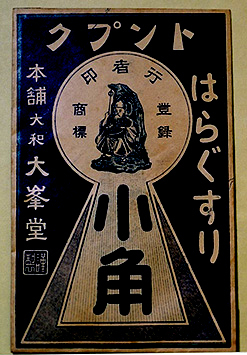 Rikichi Tsuji founded “Gyoja Hompo Ominedo,” the predecessor to Ominedo Pharmaceutical Industry Co., Ltd. Rikichi grabbed people’s attention with his exceptional ability and unique management philosophy, and enormously improved business performance but never filled his pocket. 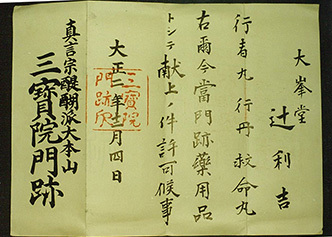 He returned the profits gained from the business to peddlers, and donated a great amount of money and goods to Mt. 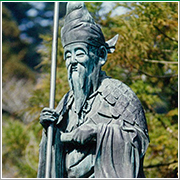 Omine Ryusenji Temple and Daigoji Temple in Kyoto, which were his places of worship. 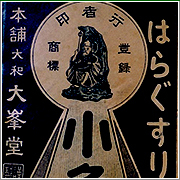 Ten years after its founding, Rikichi changed the company name to “Tsujiyakuho” and presented a noble figure (bronze) of En no Gyoja, the father of Mt. 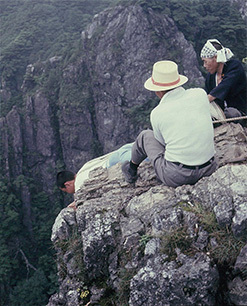 Omine, to Ryusenji Temple. 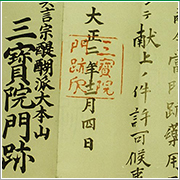 The figure is still kept in the temple with a donation form from that time. 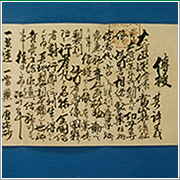 Daigoji Temple Sambouin Monzeki gaved Rikichi Tsuji contribution licenses of “Gyojagan,” “Kyumeigan,” and “Gyotan.” It was said that Rikichi Tsuji donated 700 seedlings of cherry blossoms in return. 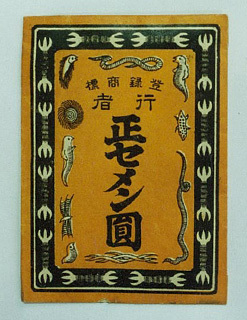 During World War II, pharmaceutical companies were streamlined and consolidated. 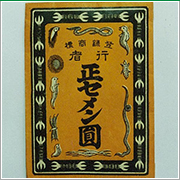 Ominedo was temporarily incorporated into Yamato Godo, which consisted of 62 medicine vendors and operated as a Tenma factory of Yamato Godo. 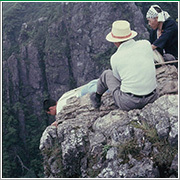 Seiroku Tsuji was appointed as Managing Director of the company. COPYRIGHT © OMINEDO ALL RIGHTS RESERVED.